Nope, St. Paul. Seems the local police decided to raid the headquarters of the RNC welcoming committee, a group of protesters planning to oppose the GOP at the upcoming convention. Enforcing a search warrant whose probable cause is “not public at this time”, the police burst in with guns drawn and began photographing the people inside the building. What was going on inside at the time to cause this outrage? Dinner and a movie. That’s right they were eating and checking their e-mail. And you thought those jack booted thugs in Denver were crazy. WTF is going on here?!!! Canada’s Stephen Harper is set to call an election (probably mid October), but not because he knows exactly where he is headed. The opposition parties have allowed Harper to enact his conservative agenda, just leaving bits ‘n bobs to deal with. The shame is, Canadian farmers are among the best I’ve ever come across. Harper’s preference is to give free rein to the processing/distribution end of the market. So maybe its not a plan, just the obvious outcome of conservative policies. Saying America needs a vice president who exemplifies the best America has to offer, presumptive GOP presidential nominee John Sidney McCain III announced today his choice of running mate: Karen Walker of New York. The announcement completes the Republican ticket just as it prepares to open its national convention in Minneapolis on Monday. McCain introduced his running mate during an appearance at the Nutter Center in Dayton, Ohio. “I proudly accept this nomination on behalf of my biggest fans — my gay posse, my pharmacists, and my husband Stan, who couldn’t be with us today because this stage has a weight limit,” Walker said. An unbelievably wealthy Manhattan business woman and philanthropist, Walker has better hair than Mitt Romney, the other candidate with economic credentials. Yet Walker also has a bigger rack than ex-senator Fred Thompson, whom backers said would attract voters due to his high profile as an actor. Walker also beat out Jesus H. Christ of Bethlehem, Pennsylvania, who ended his candidacy after Super Tuesday. Many of Christ’s policies are out of step with the Republican base, whereas Walker is well-known for her charity work, but is also a slumlord. Most of all, Walker is eminently qualified in the area of foreign policy. 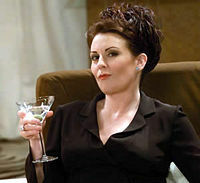 “Not only does Karen Walker have a fabulous rack, but her ability to be functional despite a consistent 0.08% blood alcohol level, as well as a physiological tolerance for prescription drugs, means she can hold her liquor,” McCain said. 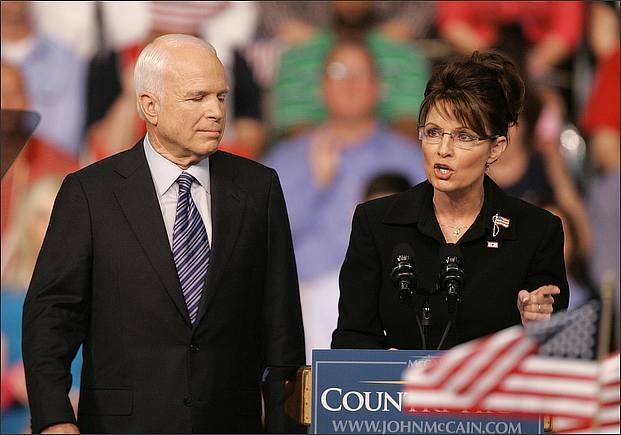 “Karen Walker will be able to drink America’s enemies under the negotiation table,” declared McCain. Mahmoud Ahmadinejad, Kim Jong-Il and Osama Bin Laden — watch out! Walker accepts. McCain can’t resist that rack, and hopes voters won’t be able to either. Campaign slogan created especially for Walker. Yes my friends it’s been a while, but today we have to lift our glasses to a group that never met a lobbyist they didn’t like, for whom no payoff is too small, and who have no trouble throwing a posh soiree for those lucky lawmakers who granted them immunity. So here’s to the Telcos! 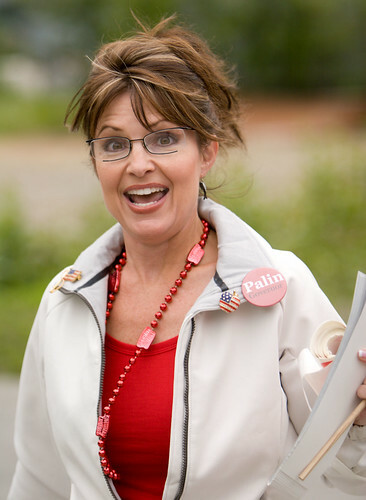 John McCain has announced today that his choice for Vice President is Alaska Governor Sarah Palin. That’s right folks, the old guy went for the hot young thing. A May/December political pairing of historic significance. I’m sure he’s thinking, she’s from Alaska, she’s got to be in the pocket of Big Oil, we’ll get along fine. Or maybe he’s counting on her hottie librarian look to appeal to all those disaffected Clinton supporters. Either way she will be known henceforth as the Geraldine Ferraro of the GOP. What kind of world do we live in where the “CHANGE” candidate picks an old establishment white guy for a running mate and the GOP chooses a woman?! Seeking to downplay the importance of the Democratic convention and its nomination of Barack Obama as the first African American to head a major party ticket, Republican John Sidney McCain III today issued an appeal to voters who are not comfortable with a party he said is out of step with most of America. “Obama and the Democrat Party don’t look like most of America,” McCain said. McCain charged that “more than a third” of Democratic delegates in Denver could clap along with the beat of the many popular songs played at the convention. Many songs were heard, including “Sisters are doing for themselves,” “Isn’t she lovely,” “September,” and of course, “Disco Inferno.” There were also live performances by Dave Matthews, Stevie Wonder, Sheryl Crow, and even country western group Sugarland. McCain scoffed at the amount of music featured by Democrats. “My friends, that’s not the America I know. That’s not the kind of easy listening music we can believe in,” said McCain. “My America is an America that goes to bed early, and doesn’t want to be woken up at 10 pm by you damn kids and your infernal rock and roll racket,” he said. McCain has eschewed music in his campaign. He has frequently told the story of how the only music he heard while a POW in North Vietnam was what Hanoi Hannah played during morning drive time. McCain also said Americans shouldn’t trust what he called “the musical party” to keep America safe. In related news, Barack Obama singlehandedly defeated the Denver Broncos 41-10 at Invesco Field. He is now the favorite in the race for the AFC West crown. The iNews 9000 Turbo will return in two weeks. The Democratic Party made history yesterday, making Senator Barack Obama the United States’ first mixed-race person to be nominated for president by a major party. “Barack Obama is ready to be president… and Barack Obama is on the right side of history,” former president Bill Clinton said Wednesday evening, as he addressed the Democrats’ convention at Denver’s Pepsi Center. Obama had been nominated by acclamation earlier in the afternoon. Upon hearing of the history-making event, Obama’s rival John Sidney McCain III attacked history, citing history’s mixed record of accuracy. “How can the Democrat Party put so much stock in history, when historians can’t even agree on the historical record?” asked the presumptive Republican nominee, in remarks to the regular Wednesday afternoon checkers game at Grant Park in Phoenix. McCain noted that some creation scientists question the extent of history, saying it only goes back 5,000 years. History also vexed him as a midshipman at the Naval Academy, McCain added. “History was always my worst subject, because there were too many events and dates to remember,” he said. The Arizona senator also accused history of bias, calling it too willing to record America’s faults. “My friends, when I am president, I pledge to conduct a thorough review of history and revise what needs to be corrected,” McCain said. In related news, Bill Clinton disclosed to the Democratic convention that he’s a complicated man, and no one understands him but his woman. Democratic National Convention organizers have been singled out for praise due to the event’s excellent logistics so far. 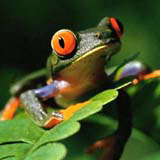 Journalists and VIPs report they have been well taken care of, their technology, food and lodging needs all met. Shadowy members of racist fringe groups are also praising convention planners. “We were afraid we’d be shunted off to some fleabag motel 50 miles from the Pepsi Center,” said Tharin Gartrell, 28, leader of a ragtag group of gun-toting meth heads said to have ties to the white supremacist movement. “Instead, we were assigned to a nice hotel where all the reporters were staying, with cable TV, room service and everything,” said Gartrell. “We couldn’t have asked for a nicer place to sit around in a meth haze and allegedly speculate about killing Barack Obama,” he said. Democratic Party convention committee chair Donna Frandle said she and her team worked very hard to anticipate the needs of convention goers. “We tried to think of everything, from the number of free rental bicycles to the height of the cyclone fence around the Free Speech Zone,” Frandle said. Even law enforcement officials say the Democrats have made their job easier. “The best innovation as far as crowd control goes has been the Violent Freaks Zone,” said Captain Harold Dobey. “The zone is located right next to my command post, which is convenient for any violent freaks attending the convention,” said Dobey. “It’s also handy for me and my officers. Monday night I checked the sign-in sheet and saw ‘Tharin Gartrell plus 3’, and now they are assisting us in our inquiries,” Dobey said. In other convention news, commentators for the major TV networks agree the biggest problem with the Democratic Convention is that it’s not Republican enough. Fireworks erupted yesterday between Hillary Rodham Clinton and her pledged delegates to the Democratic National Convention in Denver. The delegates denounced their preferred candidate’s pro-Obama statements on the convention’s first day, accusing Clinton of betraying herself. Democratic leaders concerned about party unity were relieved when Clinton, the second-place finisher in the delegate count, strongly attacked Republican nominee John Sidney McCain III over a new TV ad. The ad claimed Obama chose Delaware senator Joe Biden as his running mate because he is threatened by Clinton. “I’m Hillary Clinton, and I do not approve that message,” she told the New York delegation, adding, “we are united,” in response to what she called attempts by Republicans to divide Democrats. Clinton’s delegates quickly expressed anger at Clinton’s defense of Obama. “If Hillary Clinton thinks we’re united, she’d better think again,” said Clinton delegate spokesperson Bella Abzug Jr. of New York. “We’re not letting Hillary stand in her own way, how dare she surrender now when the nomination is in her grasp,” Abzug said. Agreeing with Abzug was another die-hard Clinton delegate, Sammi Davis Jr. of Nevada. “If she’s not with us, she’s against us. So I’m supporting Hillary for President, and if she doesn’t like it she can bite my keister,” said Davis. Clinton delegates seemed to be in agreement that even without Hillary Clinton behind them they would continue her presidential campaign without her. Supporters plan to enter Clinton’s name into nomination on Wednesday. “We’re going to make the convention hold ballot after ballot until Hillary wins, we don’t care if it takes a month,” Davis declared.